I realized I haven’t been posting about weddings here for quite sometime now and to think that this used to be our wedding blog and most of my posts from before are about weddings.. I coordinated a dear friend’s wedding last April, she started preparing last year and I gave her ideas on what she can DIY for her wedding day. And this is what she came up to. And the luminaries which I think is beautiful! I love the glow of the orange light in the dark. She painstaking made all of these luminaries. 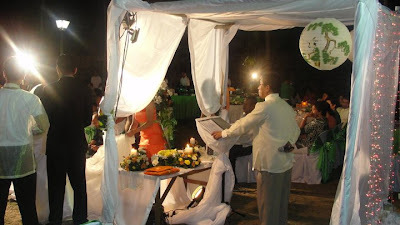 And should I say hats off to me and to my husband also for doing this canopy? Although it was not as beautiful as I wanted it to be, still hats off to him, he needed a trailer hitch to transport all of the materials and he assembled it under the heat of the sun..
and last but not the least..hats off to me and to Jemay for doing the table set up (table napkins with a rose) also under the scorching heat of the sun! I salute your patience and creativity (also to your husband) for making the canopy. Your friend is also very creative and resourceful. I know somebody who does her parties all DIY---and she's absolutely amazing in it.